The German Academic Scholarship Foundation is an institution strongly supported by the German government, which serves as the main instrument to recognise and support outstanding students in Germany. The students are rewarded based on their personalities and their academic or artistic talents, leading to a likely outstanding contribution to society. In the scholarship, the scholars have the opportunity to actively shape the educational portfolio by organising events concerning scientific and social issues. Within the above-mentioned scope, the seminar “Focus 2050 – sustainability scenarios” took place in Vienna from 11 to 14 January 2018. Participating scholars represented a broad range of scientific backgrounds ranging from law to engineering and from psychology to politics, and were at various stages of undergraduate and postgraduate study. Common to all was a deep interest in sustainability and an impressive capacity to “think outside the box” in considering possible solutions to what can sometimes seem intractable challenges. The objective of the seminar was not only to evaluate the status quo, but also to discuss current scenario building methodologies and to find ideas and solutions for a more sustainable future. This was achieved through scholars discussing, in working groups, various dimensions of sustainability. These included the influences of modern consumption and new technologies on energy/water interdependencies, and the influences of human interactions in sensitive ecological systems. 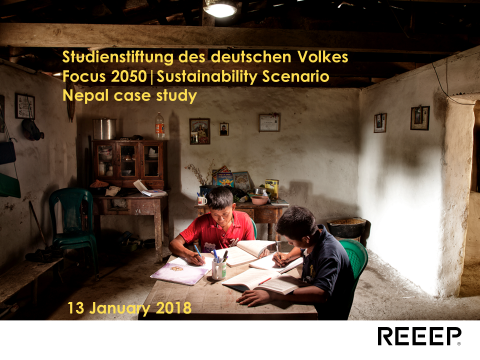 On Saturday 13 January, Olivia led a workshop that explored a sustainable development scenario to 2050 using Nepal as a case study, building on REEEP’s considerable experience and ongoing interest in Nepal. The scholars received a country brief focused especially on Nepal's political and legal structures, socio-economic development challenges and energy sector. Working in small groups the scholars were then invited to contribute to the development of a sustainability scenario that sought to address, inter alia: technical challenges in energy generation and supply; securing and maintaining a social license to operate in respect of disruptive technology; leveraging appropriate, long-term finance for sustainable development; and consistency with the Sustainable Development Goals (SDGs). Each working group was allocated an SDG relevant to Nepal and asked to design a sustainability scenario based on the requirements of that SDG. In view of the cross-linkages in barriers to sustainable development, scholars were encouraged to adopt an interdisciplinary approach. In particular, to apply their critical thinking skills with a view ultimately to articulating a sustainability scenario that encompasses economic, environmental, social and governance imperatives. Interaction between working groups was encouraged and each was instructed to address (and seek to influence) different stakeholders in its final presentation. As a result, the broader group was collectively able to draw a relatively detailed scenario of a developing country in 2050. Olivia’s informative advice and support changed the scholars’ Western view of the world for a few hours and helped them design a picture of Nepal in 2050. Many thanks from Constantin Lindenmeyer, Tim Deisemann, Lisa Oswald and Jana Weber for the productive and inspiring cooperation with Olivia Coldrey and REEEP. REEEP appreciated the invitation to participate in the seminar and share our experience of promoting sustainable development through investing in clean energy. We were also happy to take this opportunity to build capacity among the next generation of leaders. We need to bring new, multidisciplinary and multigenerational perspectives to bear on what can be enormous challenges to achieving sustainable and equitable development globally. In this sense, the scholars’ fresh thinking and creativity were both encouraging and energising. Judging by their intellectual capacity, enthusiasm and thoughtful contributions to the workshop, the future is in good hands.